There are some 400 species of Mantis Shrimp, which is a lot more than I'd ever thought, and none of them are actually shrimp. They are usually found in shallow, tropical or sub-tropical waters across the world. Actually, they aren't found all that often since they mostly hide away among rocks or in burrows they dig for themselves and the smallest ones are under an inch long. Some are nocturnal, others live for the day, still others the twilight of dusk and dawn. So, no matter what the time, you can always call upon Mantis Mega-powers to help you out of a tight spot. Like if you got trapped in an aquarium or something. Spearers are armed with deadly raptorial appendages lined with sharp, barbed and rather grisly spikes. They look a lot like the forelimbs of mantises, hence the name. In fact, we already looked at the Praying Mantis some time ago. A long, long time ago. In the cold, dark and lonely past... Anyway, both creatures use these weapons in a similar manner - lunging at prey with impossible speed and grasping them as they eat, all the while stabbing, slicing and just generally being utterly awful. It just so happens that the Mantis Shrimp does it 10 times faster than the Mantis, even though it's doing it in water rather than air. Because of their particular brand of brutality, spearers prefer soft bodied prey like fish and shrimp. You know, something they can really get their spines into. The specific bit of science that occurs is called cavitation. It's to do with cavities... holes... bubbles. They should have called it bubblation. It's something that can happen with fast flowing rivers, propellers or fast swimming dolphins. The Mantis Shrimp does it with an arm. Actually it's called a dactyl, which has various meanings including "finger" and "little finger". They have more power in their little finger than most things have in their wildest dreams. They punch with such speed and acceleration that the pressure of the water behind the dactyl falls. It falls so much that it causes ruptures in the space-time continuum water, what you could call "bubbles". They can be about half a centimetre across or far smaller, but they are full of water vapour. The bubbles soon start to collapse as the pressure of water around them rises back to normal. They get smaller and smaller, leaving less and less space for the water vapour. The water vapour responds by increasing in pressure and temperature, soon reaching several thousand Kelvin (several thousand Centigrade/several thousand Fahrenheit) for a brief moment, emitting a spark of light and probably creating a whole new universe somewhere! All this happens in basically no time at all, so it's very difficult to measure the temperature. Even seeing any of it requires all sorts of slow motion technology. With this incredible power they could probably take over the world. Luckily for us all, they are content with smashing open tough prey like clams and crabs. It is no wonder they get called "thumb splitters"! Some sort of Mantis Mega-fan describes how even a 1 inch long Mantis Shrimp can draw blood, while a 4 centimetre long one can cut to the bone. Ouch! Then he talks about a 2 inch slash and how he needed surgery to remove the broken off dactyl tip from a blow he received from a 7 cm long specimen. Even the guy who got a finger amputated after infection is talking about a wound inflicted by an 18 cm one. Some Mantis Shrimp reach a foot long! There have even been some that reached 38 centimetres! Clearly, this is one formidable (Super) animal. Needless to say, these armaments are of the utmost importance to the Mantis Shrimp. 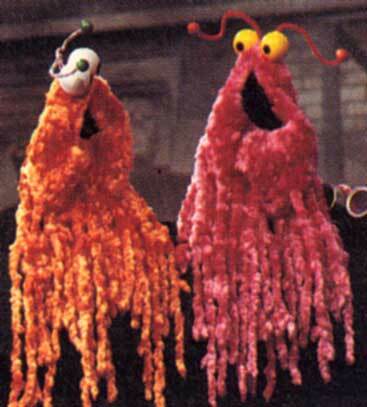 All that cavitation causes damage to their Flaming Fists but it gets sorted out when they moult. If one is damaged beyond repair they may actually tear it off themselves. They can still feed with the one left and a new, small, useless appendage will arrive with the next moult. It improves with each moult thereafter, such that it takes about a year for a new, good as old one to appear. Cup of tea I think. Mantis Shrimp, part 2: Eyes With Which to Totally Own! So, we have seen the Mantis Mega-punch, now it's time to use are puny and pathetic eyeballs to look at the Mantis Super-sight. It's not that their eyes are on stalks, although that's pretty cool in itself. It isn't even that each eye has a remarkable mobility and can be moved independently of each other, although that's pretty darn splendid. No, the real thing is that they are regarded as the most complex eyes of any animal in the world. For one thing, each eye is separated into three parts; an upper hemisphere, a mid-band and a lower hemisphere. Right off the bat, this gives them trinocular vision in each individual eye! 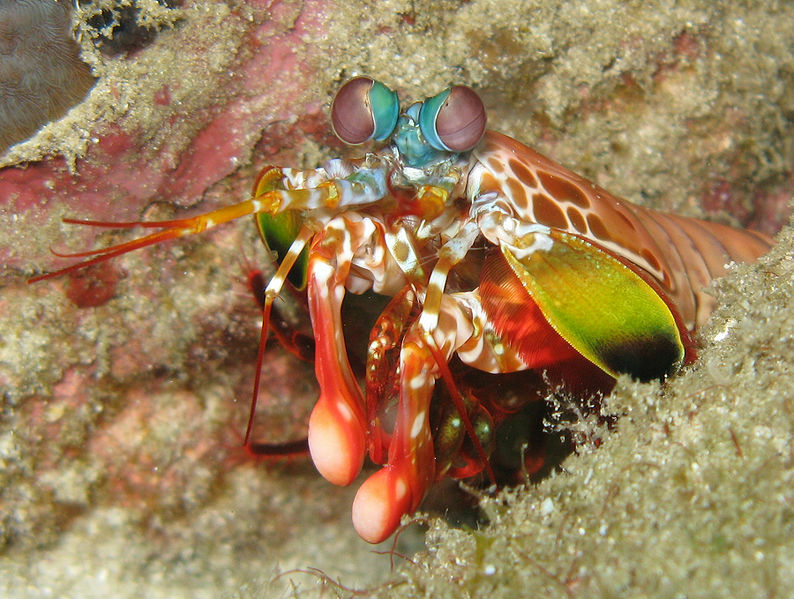 We require both eyes to gain some paltry binocular vision, but the Mantis Shrimp has depth perception in EACH one. This is clearly great for hunting and escaping predators, or doing both at the same time, somehow. Aside from that, the upper and lower hemispheres are used to see shapes and motion, which is pretty unremarkable. The mid-band however, sees colour. Colour is pretty cool. I quite like it. It's clear that a lot of Mantis Shrimp are partial to a bit of colour, too. Actually, they must really, really like colour. A lot. We are most sensitive to three main colours, red, blue and green. 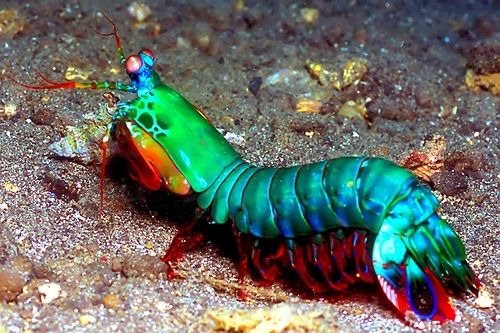 The Mantis Shrimp on the other hand, is most sensitive to 12 different wavelengths of colour! This means they can see coral reefs and the like in a technicolor richness that would probably blow our tiny mind's eye. Some Mantis Shrimp can also glow to communicate with each other. But Mantis Shrimp can see not only "visible light", but also ultraviolet and infrared. Many insects can also see into the ultraviolet, and it provides a whole new layer of communication in the world. It perhaps also helps the Mantis Shrimp to further distinguish between various animals. But it doesn't end there! They can also see the polarity of light, a skill they share with cephalopods, arthropods and some others. We didn't even know about the polarity of light until 1808, and then we had to come up with all sorts of gizmos to see it properly. As it turned out, we actually can very slightly perceive the polarity of light. This is great news for romance. By night one can point at the stars and speak of the moon, by day we might point at the clouds and speak of how clockwise the morning is. Actually, pretty much all of those animals can only see linearly polarised light. That is, when it's going in a wave and moving up and down or left and right. 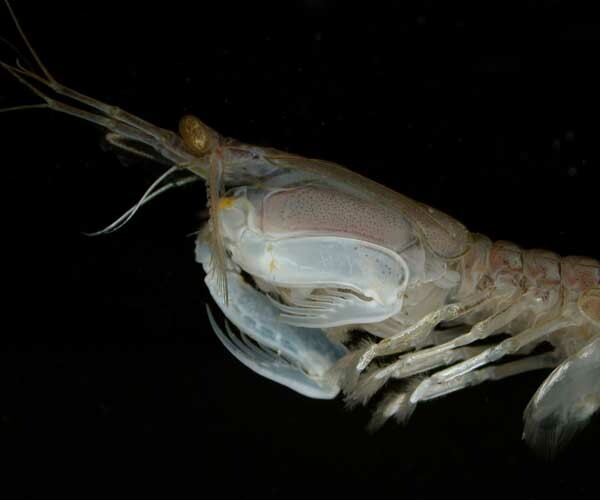 Since light gets polarised by reflection and refraction, seeing it is really useful for getting a clear view of transparent and semi-transparent animals like shrimp or for shiny fish, be they predator or prey. But light can also be circularly polarised, where it goes in a kind of clockwise or anti-clockwise spiral, and it can also go in any oval shape in between. 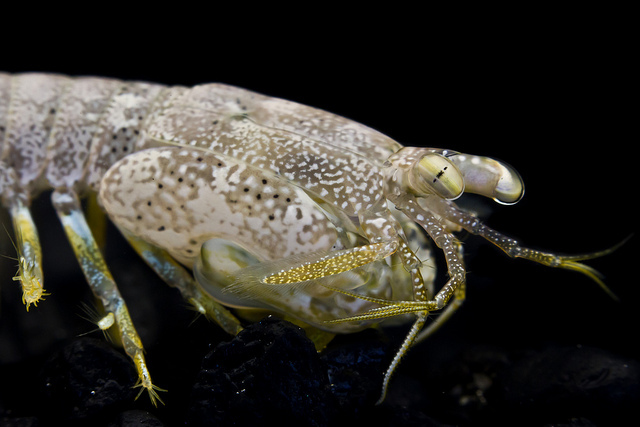 Circularly polarised light is rare in nature, but there are some Mantis Shrimp that can not only see it, but reflect it off certain body parts. This gives them their own private communication system that no other animal can see. Then there's this thing where at least some Mantis Shrimp are sensitive to circularly polarised light across the entire visible region, which is something beyond all of humanity's current technological ability. And there is one Mantis Shrimp that is the only animal known to be capable of simultaneously detecting, like, ALL the polarisation of light or whatever. Seriously, I'm not paid enough to learn all about "Stokes parameters" and I don't even know what else. Also, I'm not paid. I'm already in dreadful need of a beer. 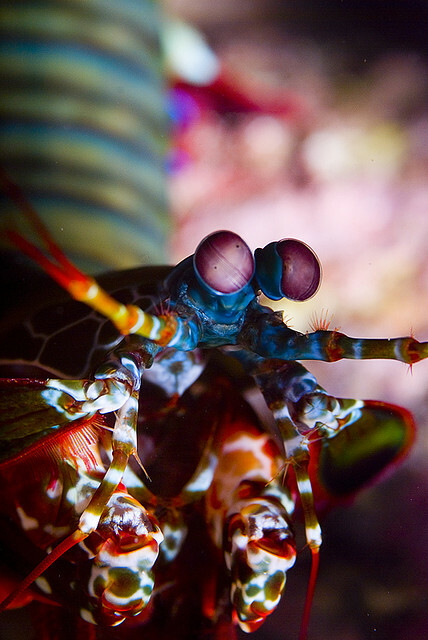 Let's just say that Mantis Shrimp eyes defeat us all with pure awesome. And that if there's one thing this post doesn't need, it's sine and cosine. I really must mention one last use of polarised light, though: it lets them see the phase of the moon. This is important because females will only mate when the tide is right, and even superheroes need a little... something. Some Mantis Shrimp mate and then never see each other again. Others move in together and start a monogamous relationship that can last 20 years. Sometimes the Missus will lay two clutches of eggs, one for her to look after, one for him to look after. Which seems pretty radical to me. Others are more traditional, where Mr. Breadwinner does all the hunting while the Lady of the House looks after the brood. Once the eggs hatch they can spend up to 3 months floating around as plankton. Fellow plankton had better beware though. Even at this early stage, Mantis Shrimp come armed with the dread raptorial appendages of their parents. These guys just don't let up! When it comes to brutality, the mini-Mantis Mega-mites are prodigies! I would like to congratulate anyone who has made it this far. The Mantis Shrimp is clearly endowed with some spectacular talent that we're still learning about and still learning from. It's an all round extremely impressive creature. They're not just a pretty exoskeleton! Oh my God! What have I done? This post is Mantis Mega-massive! I remember when I thought the Frilled Shark post was long, seems silly now. I hope you're proud of yourself, Crunchy! Also, check out this great documentary called The Fastest Claw in the West. Part 1, 2 and 3. It features David Attenborough, a man showing way too much leg, a Mantis Shrimp getting concussed, using their tail as a shield, a female who will NOT let her chosen beau get away, all sorts of Mantis Shrimp memory and learning and 80s music. Wonderful stuff! Circus of the Spineless #61, hosted at NeuroDojo. It's just that I'm not 100% sure if I know or not. Wait and see, I suppose. WHY is mantis shrimp not featured in Pokemon or DoTA?? It owns all the crap all them stupid games come up with. what we need for ultimate underwater defence systems is ten foot long Mantis Shrimps (which can double up as signal transmitters/ recievers). This thing rolls in with style!! 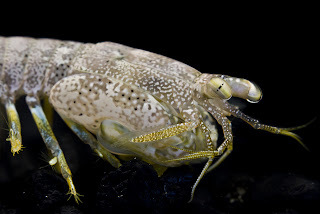 You're right, Mantis Shrimps are pretty, darn fearsome creatures. I've learnt quite a lot in trying to find out exactly how amazing they are and why exactly. Ten foot Mantis Shrimp... the problem with that is they appear to be one of the more intelligent crustaceans. If we could ensure complete control of them and they won't, like, get angry and stuff, then they would definitely be an astonishing weapon. Hopefully we can keep them out of the hands of the bad guys! Pistol Shrimp will definitely be coming soon. Probably a couple weeks, once there are no crustaceans on the front page. "Phenomenal", gosh! Thank you. The documentary is really cool. It came out in 1985 or so, which means it lacks a lot of the stuff we've found out since then. It's still great for all the little details of Mantis Shrimp life it shows, though. Some of the species off the West Australian coast have a golf-ball sized planktonic larva, that's also golf-ball shaped - apart from from the four caltrop-spikes it defends itself against larger predators with. Golf ball sized? Wow! And spikes, too. These guys are just born mean! Pound for pound the ultimate predator with the ultimate arsenal. BTW, there are images of mantis shrimp 60cm long (!! ).